Craneboard is a low cost, open source reference platform to help the developer community leverage the benefits of the AM3517 processor while leveraging a host of exciting peripherals. 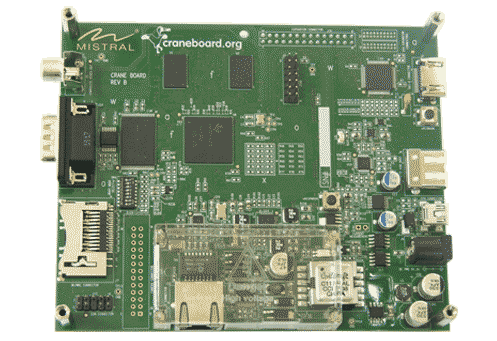 Craneboard is a hardware development platform that enables customers to develop general purpose computing and other applications based on the Sitara AM3517 ARM Cortex – A8 microprocessor device. The AM3517 processor from TI comprises of Microprocessor Unit (MPU) sub-system based on ARM Cortex–A8 microprocessor, POWERVR SGX Graphics Accelerator sub-system for 3D graphics acceleration to support exciting Graphical User Interface options while maintaining fast and fluid transitions display and gaming effects and Display sub-system with several features for multiple concurrent image manipulation, and a programmable interface supporting a wide variety of displays.